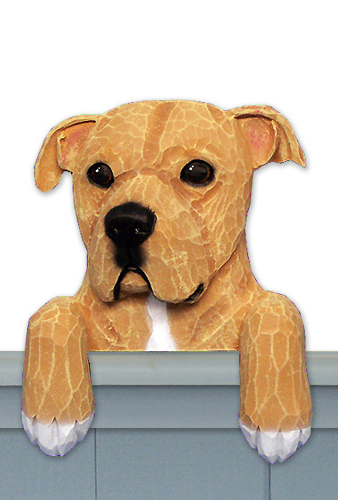 Amstaff Terrier (Natural) Dog Breed Door Topper. Our hand cast, hand painted Amstaff Terrier (Natural) Dog Breed Door Topper is cast from original wooden carvings from our favorite woodcarver. They are perfect for sitting on the top of a door, a shelf or a mantle - the dog heads average approximately 6 1/2" high. Each door topper is custom made!